The conference attendees will have the opportunity to disseminate, acknowledge and discuss of cutting edge research on the thematic of emerging water micropollutants, including the development of new sensors for in-situ monitoring, innovative devices for on-site detection or laboratory analysis, and their proper removal from water and wastewater by means of cost-effective techniques. Participants will include academic researchers, scientists and specialists from water processing and associated industries. The main aim of this conference is to promote multi-disciplinary collaboration and transfer of knowledge among scientists, industry and official authorities concerning the problematic of emerging micropollutants. The abstracts selected for either oral or poster presentation underwent a review process within the Scientific Commission of this conference. LE STUDIUM, together with BRGM, the University of Orléans, CNRS, INRA and the cluster DREAM will support this international conference in the framework of PIVOTS project. The PIVOTS project is a coordinated set of seven experimental and analytical platforms focused on environmental quality monitoring and sustainable management of natural resources (soil, subsurface, surface water, groundwater, sediment and air) within a context of global change (increased anthropogenic pressure and climate change). The innovation through PIVOTS will be founded on an integrated approach based on excellent research by academic and industrial experts together at all stages of the value chain, from fundamental research to validation of products and services. The teams involved originate from BRGM (French Geological Survey), University of Orléans, CNRS (National Center for Scientific Research), INRA (National Institute for Agricultural Research), Antea Group (consulting and engineering), DREAM (cluster of enterprises) and LE STUDIUM (Loire Valley Institute for Advanced Studies). Dr Marius Secula, LE STUDIUM Research Fellow / ARD 2020 PIVOTS Programme. Abstracts for poster should be submitted before Sunday 7th of October 2018. Please upload your abstract during the registration or send it before the deadline to maurine.villiers@lestudium-ias.fr. 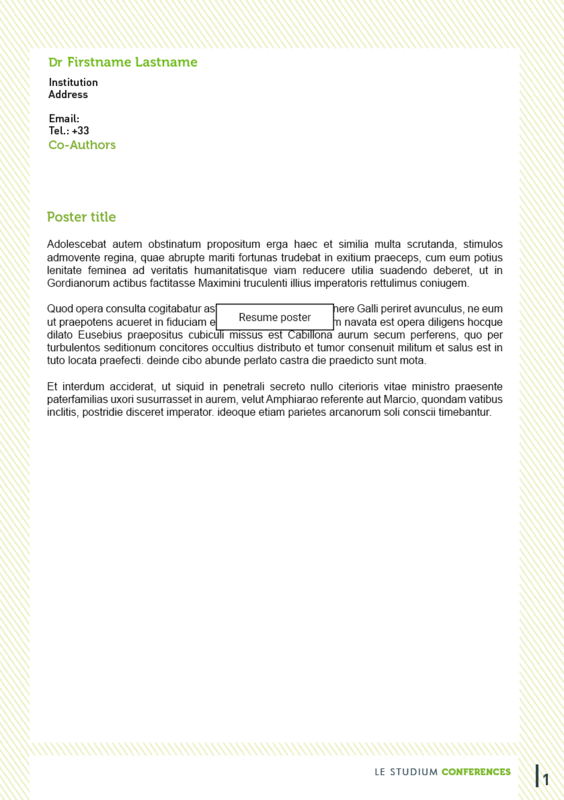 Please download the template for posters. 15:15 Dr Nathalie Guigues - Assessing the performances of sensors and devices for water monitoring: why and how?